Our story so far: For the better part of a decade, Orb Audio proceeds to build a stellar reputation for high-end home audio with their award-winning, modular systems based around the iconic spherical speaker for which the outfit is named. But then the iPod and its iDevice cousins sneak into a rapidly-growing number of pockets, creating a massive, swollen market that’s eager to be introduced to high-end audio, yet yearns for a more compact, less complex setup than the traditional high-end home audio layout. And what about all those computer users stuck with tinny PC speakers? Surely they deserve siren-like audio too. 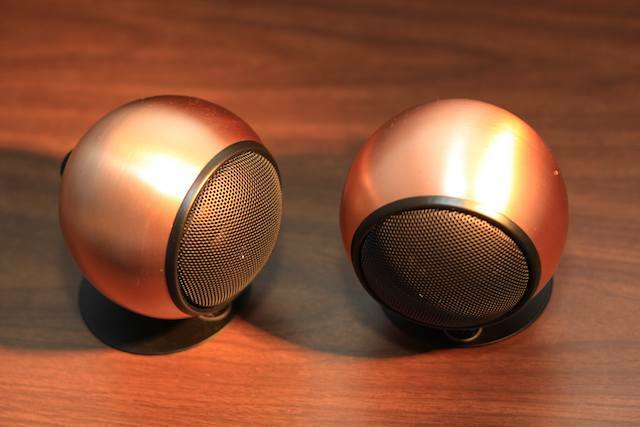 So the company comes up with a solution: Take a pair of the celebrated spheres, marry them to a tiny amplifier and call it the Orb Audio Mini-T Amplifier and Speaker Package ($299): bam, instant Orb Audio experience for your iDevice or Mac! There’s certainly no problem with the way the speakers sound. The little burnished balls sing like canaries, with crisp, beautiful, room-filling high-end — everything sounds bright and clear. The Orbs also do an excellent job of imparting depth and dimensionality. There’s almost zip from the bass department though, and you’ll understand why later. 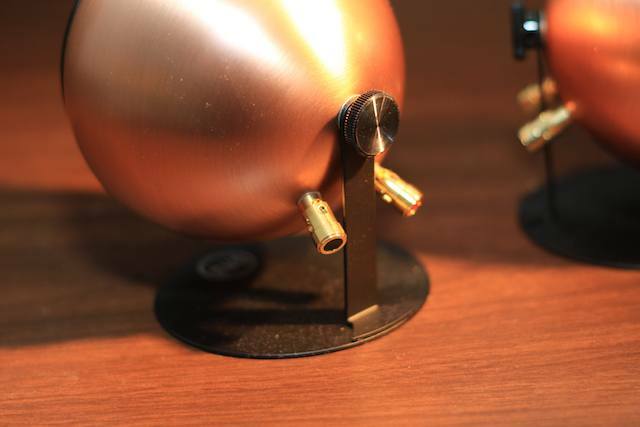 As expected from high-end audio stuff, proper speaker cable is the connector of choice, and connects the Mini-T amp to the speakers; hooking the speakers up is pretty easy, as the cable slots through two sprung terminals at the back of each speaker. The only 3.5-inch cable you’ll have to mess with is the connection between your iDevice or Mac and the Mini-T.
Because the orbs are, well, little balls, they’re pretty easy to set up anywhere on the supplied bases. And because of their modular nature, there are a bunch of configuration options should you decide to add more balls, including stand options that allow multiple Orbs to be mounted on a single stand. They’re also fairly attractive, and available in different finishes — like black, white or silver — to complement practically any decor. This modular, custom approach is really a big facet of the system. Users can mix-and-match from the tightly integrated pool of components to create the perfect system. But this approach isn’t exactly the best approach for a small desktop system. Let’s begin with build quality and design of the Mini-T Amp, which fell far short of what’s expected of a $300 audio system. 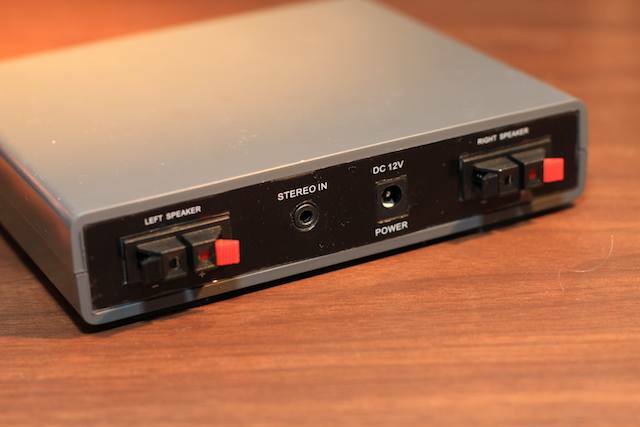 The amp housing and single volume/power knob feels very plastic-y, and the whole unit is completely devoid of charm; it’s like something fished out of the bargain bin at the local Radio Shack (no offense, Lance). 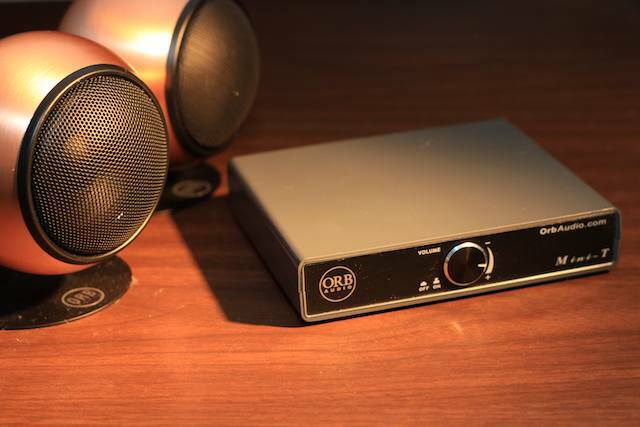 The disappointment is especially noticeable considering how much effort Orb Audio puts into making their speakers look so appealing. 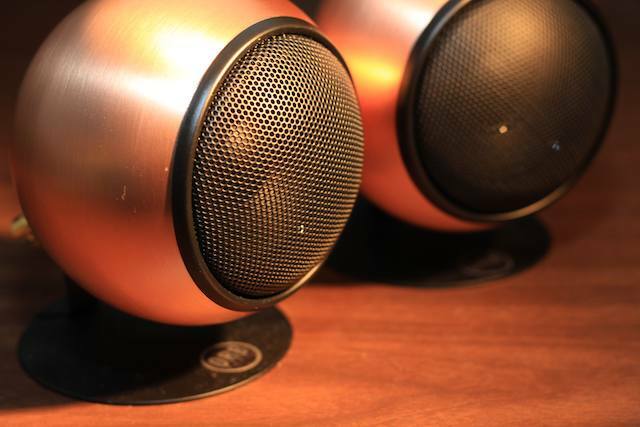 Which brings me to another issue: the bass-colored pair of speakers given to us for review were mismatched, and one was noticeable lighter than the other. It was probably an unusual error, but it just added to the impression that the set was unpolished. But here’s the meat of the problem: The set has a gaping hole. The speakers do a great job at what they were designed to do, but they just don’t have any low-end punch. There’s simply no bass. Of course, that’s because they were probably designed to be used with a subwoofer — at least, they sure sound like they were. So it seems like what we have here is half of a great, high-quality (we’ll call the speaker color mismatch an aberration) system that’s been hastily pressed into service as computer or MP3-player speakers. And considering there are some great systems out there that either, for the same price, come with a subwoofer, or don’t and are designed to be used without one, and still sound great (and usually cost less), the Orbs are a tough sell. A perfect example of a great product shoehorned into a product category it wasn’t designed for. If you’re looking for computer or iPod speakers, there’re better choices.